One of the big reasons for creating PDF documents is to put them online. When you do this, you may want to link to a particular page in the document. In other words, you want to refer to information that is on a particular page on the PDF document - you do not want to refer to the whole document or provide additional instructions on the page where the required information is. Now, support for the page parameter is far from perfect and not universal. If the URL is launched by an OS shell program, it may truncate the parameters. The browser or the PDF plugin may do this. Even if the page parameter manages to survive, the PDF viewer application may not support it. One alternative is to bypass the page parameter completely. You could instead rely on support for "PDF actions" in the PDF viewer applications, which is more reliable. You could add a PDF action to the first page of the PDF document so that the viewer application (such as Adobe Reader) will automatically jump to the required page instead of the usual page 1. Here is how you do it using PDFOne (for Java). Here is a sample PDF document that was modified using this code. You can download it and test it. 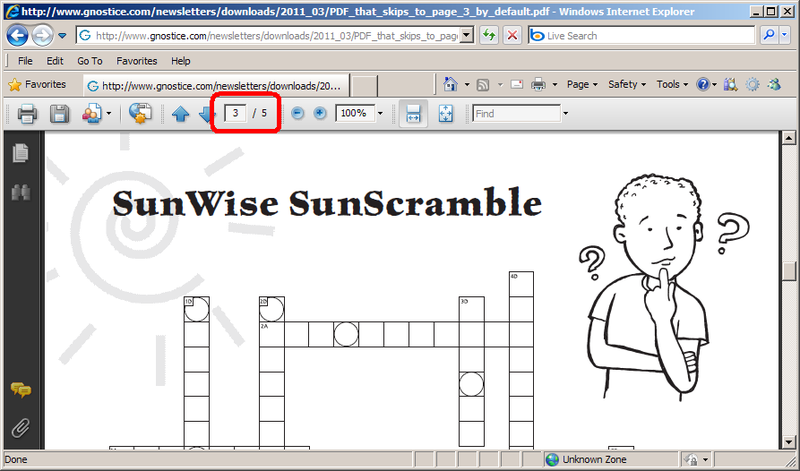 When viewed inside Adobe Reader, page 3 will be displayed by default instead of the usual page 1.